Esser® wines are produced from the cool Central Coast Region of California and crafted from sustainably farmed vineyards. These wines express the fruit, the climate, the terroir and water into a poetic expression of flavors long sought by wine connoisseurs from around the globe. Monterey County, CA MapTemperature is critical for the development of flavor, fragrance and acidity -- lack of heat and grapes rarely ripen; too much and the acidity, delicacy and the long lasting qualities of the grapes expressed in the finished wine are lost. Esser wines benefit from the daily cooling effect of the Pacific Ocean, creating flavorful and expressive varietals with complexity, finesse and balance. The selective vineyard sites span from the north of the Salinas Valley Riverview (Region 1) and Viento (Region 2) to the south of San Lucas (Region 3) and Hames Valley (Region 4), just north of the San Louis Obispo County line. The grapes are processed expeditiously in the modern winery facility in Greenfield, the center of their vineyard holding. After blending the "Best of the Best", the finished wine is transported in temperature controlled trucks to southern Napa for bottling, followed by aging in temperature controlled warehouse facilities of the Napa Valley. Under the new ownership and with a team of seasoned professionals, Esser Vineyards is positioned as one of the premium Central Coast producers creating award winning Sauvignon Blanc, Chardonnay, Pinot Noir, Merlot, Cabernet Sauvignon and Rosé of Syrah. 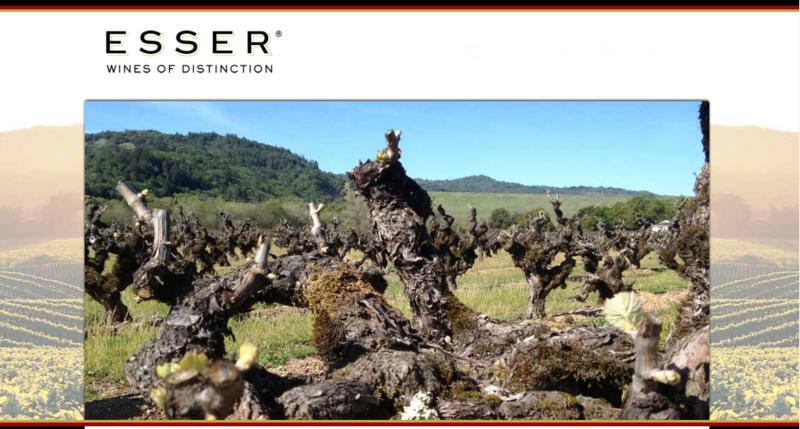 Esser wines offer Old World elegance, and express terroir as well as exceptional varietal character. Appellation Ventures was formed in early 2013 by seasoned professionals and acquisitioned Esser Vineyards in August of 2013. Much time was spent re-branding and re-launching our quality wine from the distinct viticulture area of Monterey County. In just three short years, our hard work has translated into highly acclaimed and award winning wine with distribution in 28 international countries and 36 states across America with a 115% sales growth rate in 2015 alone. Scheid Family Vineyards – All of the wines are sourced from grapes grown in the cool Central Coast / Monterey Valley region of California and crafted from sustainably farmed vineyards of the Scheid family who have been farming grapes in the area for over 40 years. The Scheid family is considered one of the top stewards of vineyard land in Monterey County and is well known for their environmentally sound farming practices, their social equity with their employees and economic viability to the region. The official certificate of California Sustainable Winegrowing can be seen below. Central Coast / Monterey County Grape Sourcing – A number of larger California wineries own vineyards and source fruit, particularly Chardonnay, Sauvignon Blanc and Pinot Noir from Central Coast / Monterey County Vineyards they own and farm. Other Central Coast / Monterey County Wineries – Generally smaller family owned wineries produce from this reafion as well and include Carmel Ridge Winery, Ventana, Le Mistral, Bernadus, Hahn Estate, Talbott and Morgan Estate. Esser Wines Pricing – Esser delivers consistent, high quality, premium wines for a value price. Nationwide the wines are consistently associated and perceived as wines from a higher price point. We work closely with our wholesalers to provide competitive BTG pricing. Wine Quality – Esser Wines continually over deliver outstanding product quality, well balance wine, with integrated fruit and layers of palate complexity. That distinguishing winemaking style seamlessly continues from vintage to vintage as has become our signature in the marketplace. Brand Support – Appellation Ventures works closely regionally to provide ample marketing dollars to all of our distributor partners in support of local market programming and promotions. Also, our website supports our partners with easy access to tech sheets, sell sheets and shelf talkers in our Media/Trade section of our website. Trade Samples – On all orders consisting of a 56-case pallet (varietal types can be mixed) 2 cases will be provided by the winery at NO CHARGE to be used for trade samples in your market, or a 50 /50 sampling partnership. Recent awards & accolades – Visit the Esser Wines website at www.esservineyards.com for a complete and up to date list of the many awards being garnered to the winery. Appellation Ventures is well funded, with many operations of expertise around the world. Beverage Tasting Institute 93"Light yellow straw color. Toasty aromas of lemon poppyseed muffin almond meal with a crisp, dry-yet-fruity medium body and an intriguing, long white peach,orgeat,and tangerine finish and light oak. A thoughtfuly constructed peachy Chardonnay." Wine Enthusiast 91 WE TOP 100 Best Buys 2014 Rank 18 " This fresh-smelling wine blends aromas of caramel apple and light grapefruit juice. The palate is racy in acidity, like a glass of fresh orange juice splashed with squeezes of lemon and grapefruit, and a vanilla warmth toward the finish. "